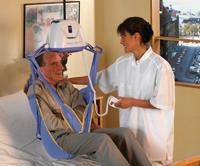 ArjoHuntleigh is dedicated to improving patient handling by providing the optimum sling solution for individual needs. Choosing the right sling is vital to ensure safe, comfortable transfer routines for residents or patients with decreased mobility. In order to meet the needs of all care facilities, ArjoHuntleigh offers comprehensive range of slings with either clip or loop attachment. The range of sling sizes covers the entire patient spectrum - paediatric, adults and bariatric. ArjoHuntleigh provides sling range according to shape, material, colour and attachment design. A Sling Guide is available providing information on the many different sling solutions which ArjoHuntleigh have developed over the years. The guide shows different ways of attaching the slings and provides helpful hints and tools for easy sling selection. All slings are available in eight sizes to cover the whole spectrum of residents (XXS, XS, S, M, L, LL, XL, XXL). Colour coded binding, together with a clear label on the reverse of the sling ensures the right sling should always be utilised. 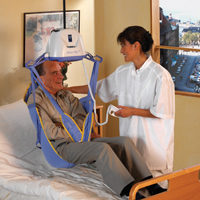 For the safety of both carer and user, every single sling undergoes stringent testing before delivery. An initial visual inspection is followed by a load test 1.5 times the maximum safe working load. Then a final visual inspection is performed. Test protocols are kept for each individual sling.